These relatively broad and short pips captivate by highest speed when counter-attacking or blocking at the table. The soft sponge allows a maximum of ball control, without affecting the "naps effect"to which you are used to. Yang Min, the best player in Europe for naps outside, relies on Speedy Soft. 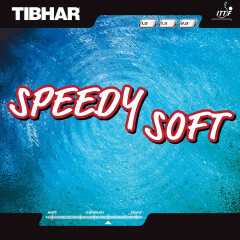 Tibhar Rubber Speedy Soft is beeing added to cart.